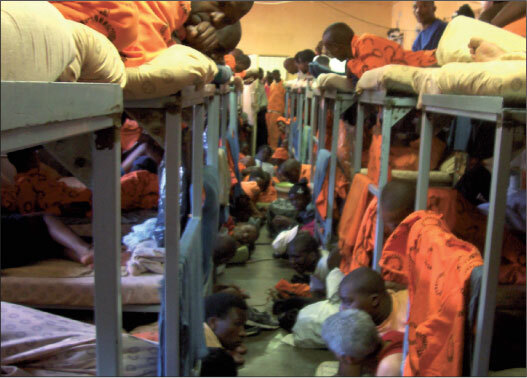 South Africa's overcrowded prisons are massive TB breeding grounds but there is 'little political will' to prioritise interventions which a joint university study in the Western Cape shows could reduce transmission by up to 94%. Stellenbosch claim.1 The study was cited by four internationally respected health-linked activist organisations in a joint declaration on the eve of the third national bi-annual TB conference in Durban (12 -15 June). The Treatment Action Campaign, Section 27 (incorporating the AIDS Law Project), Médecins sans Frontières (MSF) and Oxfam (the international poverty relief confederation) said the university study exposed a 90% probability of TB transmission per patient per year in Pollsmoor, a large prison in Tokai in the Cape Peninsula. Overcrowding was a major infection driver, with prisoners commonly held in mass cells in extremely close proximity for up to 23 hours a day. Besides the obvious measures, the departments of correctional services and health should ensure that prisoners who were TB-positive were diagnosed earlier and received proper treatment to reduce mortality. Pollsmoor mirrors disease conditions in scores of other South African prisons. If the country's leading cause of death was to be reduced, it was 'crucial' that there be a general expansion of TB diagnosis and access to existing and improved treatment for TB and multi-drug-resistant TB (MDRTB). Services could no longer be limited to certain areas and facilities while better diagnostic tools and medicines and access to them were 'vital', the organisations said. Five crucial interventions were needed: diagnosing all people living with TB and drug-resistant (DR) TB; ensuring access to the best available medicines and regimens; improving the affordability of medicines; decentralising DR TB care; and reducing prison crowding and implementing active case finding and infection control. Calling for decentralised care to be rolled out nationally via the training of nurses to manage treatment and community health workers to support ongoing care, the group acknowledged the government's policy shift to decentralisation but said the handful of current sites was simply not enough. The activists said that while the Department of Health had reduced the prices of several TB medicines during its last tender, the country continued to pay higher prices for many medicines than elsewhere internationally. Linezolid, for example, was unaffordable and should be available at lower costs. Pfizer charged R8 460 per patient per month (for linezolid) in the public sector and more than double this for NGOs such as MSF. Suggested solutions included importing lower-cost medicines from overseas or pooling procurement with other high TB burden countries. Funders and developers of new medicines in the pipeline should ensure that, once registered, they were made 'widely available at low costs'. The group lauded the introduction of the GeneXpert diagnostic tool by Cepheid (able to detect TB in many patients who currently test false-negative using smear microscopy plus detect rifampicin resistance), but criticised the cost of the machines and cartridges, saying a cost reduction would allow critically needed expanded use in all developing countries. More research was needed to discover cheap, laboratory-free, point-of-care diagnostics. Linezolid offered hope for patients failing on DR TB but was not yet widely available. The compassionate use of bedaquiline (promising results in Phase II trials) for patients who had no other treatment options provided a potential chance of cure and was already conditionally available in several countries. The group called for the Department of Health and the Medicines Control Council (MCC) to facilitate access to important new medicines in the pipeline for patients in dire need. Once these medicines received pre-approval from the Food and Drug Administration (FDA), they should be fast-tracked by the MCC. The group said funding for research into new medicines to shorten and simplify regimens and reduce side-effects (hearing loss, paranoia, depression and kidney failure) was critically needed. (TB regimens usually take 6 months to complete and DR TB regimens up to 2 years).